Sarasota County's 2018 NEST Calendar is now available at county facilities, while supplies last. Each year, the Neighborhood Environmental Stewardship Team (NEST) produces the calendar, which supports the county's goal of environmental stewardship. It cultivates a strong conservation ethic in the community's youth and adults. 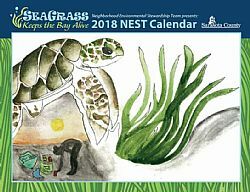 The theme of the 2018 calendar is "Seagrass Keeps the Bay Alive," in which students were asked to convey that what we do on our lands and in our homes has a direct impact on the health of our beautiful bays and beaches. Students from schools across Sarasota County were honored by the Sarasota County Commission during Wednesday's board meeting. During a breakfast ceremony prior to the meeting, commissioners signed each winning student's calendar. Elementary school students in all public and private Sarasota County schools, including charter and elementary-age home-schooled students were invited to participate. There are nearly 13,500 acres of seagrass beds in coastal and bay waters in Sarasota County. Sea life such as manatees and sea turtles depend on the seagrass for food. It also serves as homes for marine life such as seahorses, crabs and sea stars. "Keeping stormwater as clean and clear as possible will help seagrass grow," said Mollie Holland, NEST coordinator. "More seagrass means more food for manatees and sea turtles, and more room for fish, seahorses and other marine life."